hi Gary ... good idea using screen ... there is a design by Bill Kreamer that uses black polyester felt ... I really like the screen idea as it is probably cheaper than felt... I would suggest using more layers of screen possibly five or six and making the box interior reflective rather than absorbive (if thats a word) ... the key I think is to have only the excahnger absorb heat and to make sure air passes thru the material in a turbulent manner therefore increasing heat exchange ... as for glazing it appears double glazing is best but a single glaze is still good. Hi -- There is some testing on absorbtion vs number of layers, and it indicates 2 or 3 layers do a good job. The test details are one of the links under the "Experimental" tab on my site. On on the fence about reflective or absorbtive back -- heat absorbed by a black back wall is still absorbed by the air (less a little that leaks through the back insulation) but the back may run at a pretty high temperature to accomplish this, which means more radiation toward the glazing, but this radiation has to get through a couple screen layers to get out. Also think that a reflective back would work well -- maybe with an added layer of screen to let less light get reflected back out the glazing. I thought the problem with screen-based collectors was the warm and humid indoor air would condense on the colder exterior surface quickly making the interior of the glazing full of condensation and in time very dirty. What is your experience in cold climates such as Wisconsin? I was wondering about the reflective interior of Bill's Kreamer's design too. Possibly the felt absorber/reflective interior combination could be included as one of Gary's future tests. I would like to try the felt absorber -- don't think I can duplicate Bill's interior geometry and still have something I can compare to other collectors, but it would be nice to see how well the felt does. 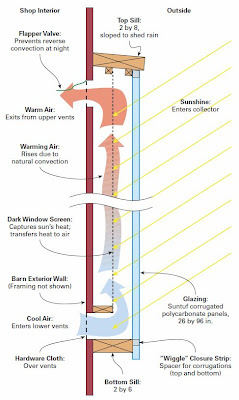 A test with the geometry of your solar air heating collector is what I was thinking of. Testing felt should be a straight forward change out with the window screen. Reflective vs flat black interior could be as simple as tacking tinfoil to the inside surfaces of the box. I'm assuming the aluminum screen was natural and not painted black. How much difference would a black coating make? I saw a post where the fiberglass outgassed. Does that make it a no go or is it something that is fixable? I've seen shadecloth from greenhouse companies that go from 30% shade to 90%shade. The material is polypropylene I believe. Do you think that might make a suitable screen? I use the aluminum screen that is sold as "charcoal" in color -- its very near black. The black appears to be something like an anodize, and does not appear to have any problem with outgassing. I'd not recommend use the fiberglass screen for an absorber. Thanks for the quick reply! I am considering putting some solar collectors on my house. The way it makes sense to me would be to have a very wide one on the south side vertical wall of the house. If the collector was to be 25' or so wide, would the screen type have too much pressure drop? Would the downspout type be a better suit for it? Has the downspout type been compared to the screen in terms of efficiency? The screen type pressure drop for that large a collector will be larger than for a small one, but its probably as low as you are going to get for a collector of that size. Probably the biggest problem for a large collector like that is getting an even flow to the whole screen or downspout area. I think that an air distribution plenum across the whole inlet edge, and a similar air pickup plenum across the whole return edge coupled with the screens own tendency to spread the airflow evenly would probably do the job. It might be easier to get an even airflow with the downspouts, but you would still need carefully done plenums to distribute the flow evenly to the downspouts. It has no fan at all -- the bouyancy of the heated air is enough to move air through the collector. 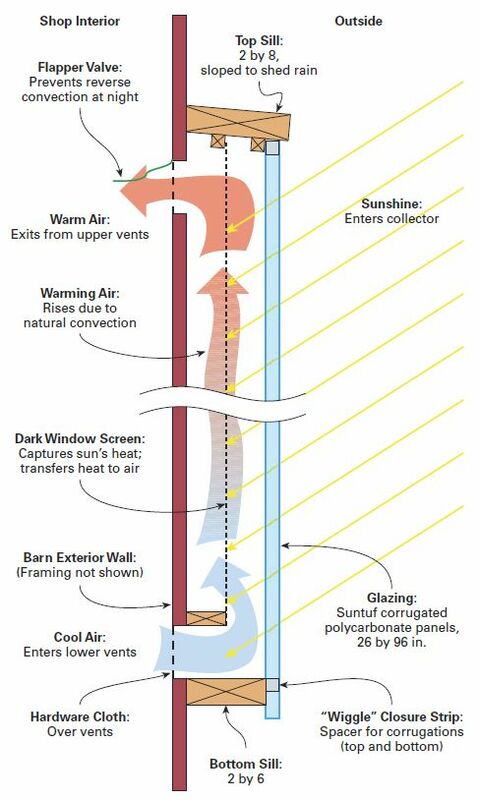 I am going to use the screen that is labeled "solar" which claims to block more sun (to provide a cooler home), but it blocks the sun by absorbing it better, because it has more fibers per square inch. A regular screen is a web of single strands, but the solar screen uses more, for example 2 strands x 2 strands or 3 x 3, etc., so more strands to get heated by the sun. I am also building my heat collector with a built-in pre heater on the input side. Hi -- That could be a good idea, but you don't want something that has a lot of air resistance as the flow through aspect of the absorber is also important. Perhaps just one layer of "solar" screen might be enough and still let air though easily? Any thoughts to using an old round large trampoline fabric in place of the screen?